I dearly wish I had taken pictures of the fancy cakes I baked last summer when they were in the car. Then I could have shown you that they did actually survive being in my car. Alas. I must have been too panicked about delivering them in pristine condition despite the scorching heat. You will just have to take my word for it! Instead, I will share a few photos of a smaller, much simpler cake I made for a baby shower. Transport is the most terrifying part of baking a wedding cake. After spending about 24 hours actively working on these cakes, I had to put them in the back of my car, where I couldn’t see or protect them, and drive them away from my house. I am a big believer in “practice makes perfect,” so I practiced transpo, as well! 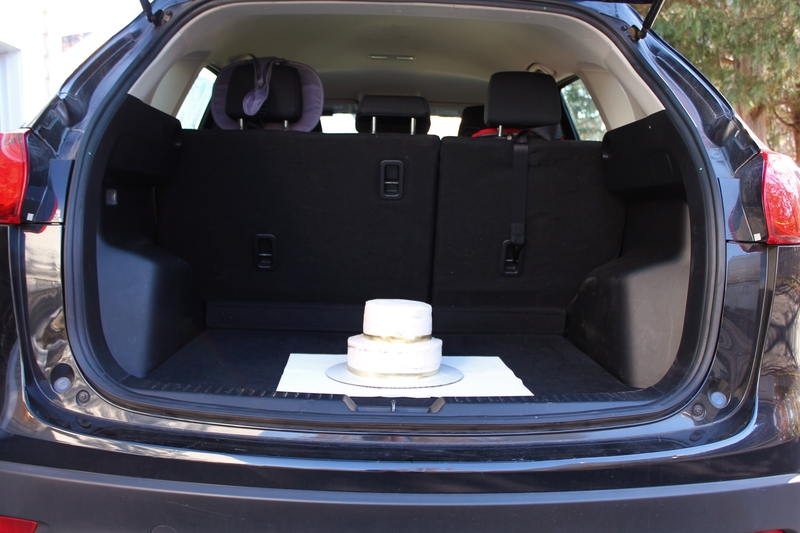 I gingerly placed that trial bridal cake in my trunk and drove 20 minutes away, down windy two-lane roads, to see whether the cake would arrive at the bride’s house in one piece. It did! What a relief. And the Big Day went without a hitch, as well, all cakes delivered as pristine as they started. Last summer, I tried on the hat of official wedding cake baker, and I baked for a gorgeous wedding with 200 guests! Today I am going to share with you the ultimate challenge of that adventure: the bridal cake. After making this cake, I truly understand why wedding cakes are so costly. 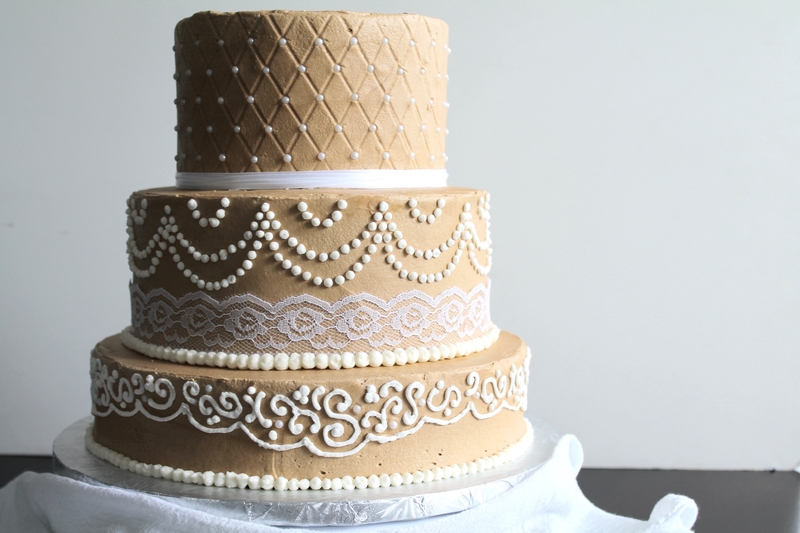 I was initially so worried about frosting a bridal cake with a brown frosting (can you make a cake look “bridal” when the natural color of the frosting is so dark? and not at all conducive to being dyed a pretty color? ), but in the dark, romantic light of the country club where the reception was held, this cake stood tall and lovely, surrounded by pink flowers and twinkle lights, and it was a vision. You can’t photograph flavor, but I can promise you that this wedding cake, with its dark chocolate crumb and rich espresso buttercream, was utterly delicious. Last summer I made a wedding cake! Or, to be more precise, I made a bridal cake, a groom’s cake, and several sheet cakes for the absolutely gorgeous wedding of some friends of mine! The bride used to babysit my children, and her mother is one of my dearest friends and mentors. It was such a labor of love. Delicious, chocolatey labor. 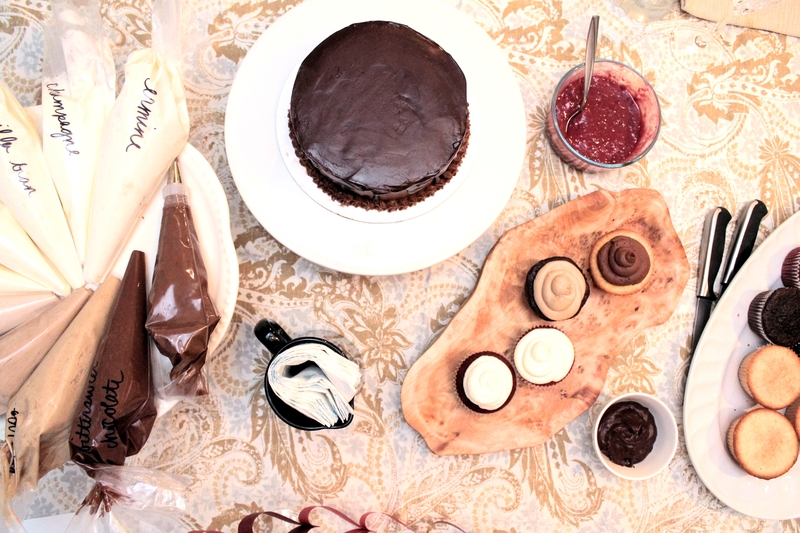 And today I am sharing part two of my series about my wedding baking adventure! Last time I shared with you the ups and downs of my planning stages, including the timing of making all this happen. 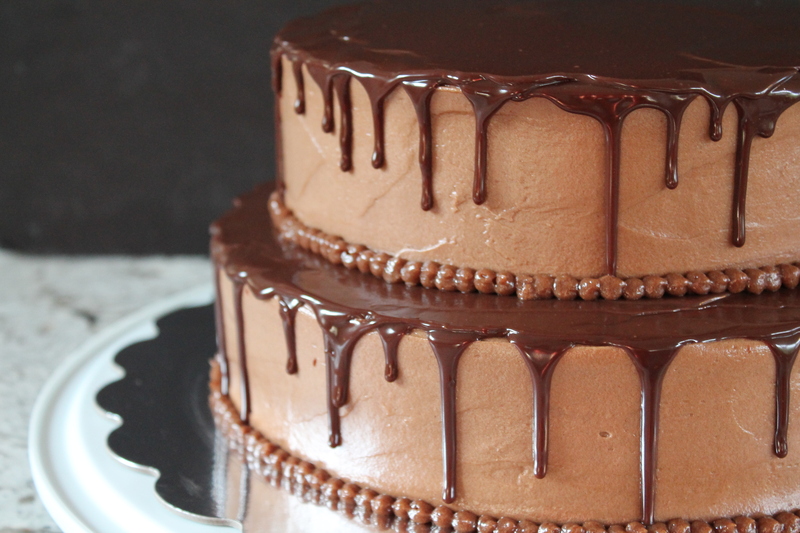 Today I want to share with you the recipes for the groom’s cake: a two-tiered vanilla cake with chocolate ganache filling, chocolate mousse frosting, and a shiny chocolate drizzle, topped with a chocolate fish to honor the groom’s favorite pasttime. Last year, when a dear friend asked me to do the wedding cake for her daughter, I was immediately all in. Yes, of course! The beautiful bride and groom just celebrated their first anniversary, so despite all of the changes going on around these parts, I thought this was the perfect time to share with you last summer’s adventure of fancy baking! Little did I know how much baking for this elegant wedding would stretch me as a baker. These wedding cakes humbled me in many ways. I had to ask lots of questions of professional bakers. I renewed my search for the perfect yellow cake recipe, one that produced a consistently moist and tender and flavorful vanilla cake. I had to practice my piping technique. I also had to ask for help from friends! I think they turned out just beautiful (and amazingly delicious). These cakes were my babies. And they took a village! These cakes were powered by: one very understanding and patient husband; my parents, who spent the wedding weekend at my house offering moral and practical support; beautiful friends who shared supplies, refrigerator space, childcare, kitten care, and an extra hand; lots of prayer; the entire first season of Gilmore Girls; several gallons of coffee; a bottle of Riesling; not enough sleep; quite a bit of anxiety; and one happy little taste tester. Not to mention: 9 pounds of butter, 16 pounds of sugar, 6 dozen eggs, 4 pounds of chocolate, and 150 pounds of love.